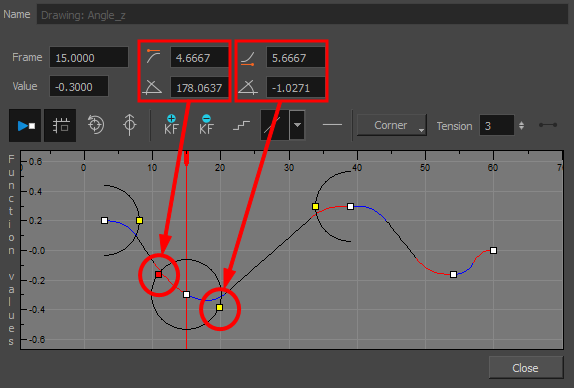 To add ease in and ease out on motion paths, you can display the function curve and modify the Bezier or Ease curve. To apply ease to multiple functions and keyframes, you can use the Set Ease For Multiple Parameters script and set the amount. The Velocity, or ease, is used on motion keyframes. The Velocity must be adjusted directly on the function curve in the Function view or Function editor. 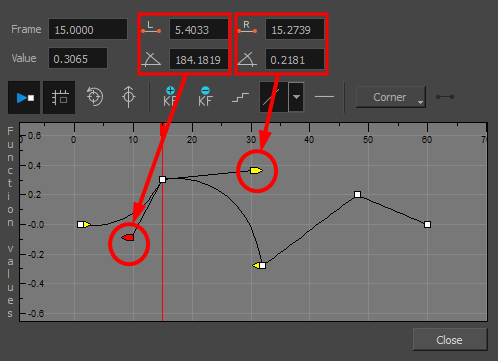 When a keyframe is selected, easing values appear in the right handle and left handle fields, as well as Bezier handle or Ease wheel controls on each selected keyframe. Pull on them to adjust the ease in and ease out, or type values in the fields. You can reshape the velocity function using Bezier controls. You can also reshape the velocity function using Ease controls. If you have several functions whose velocity you want to adjust at the same time, you can use the Set Ease for Multiple Parameters dialog box. It allows you to apply the same velocity parameters to all the selected keyframes in the same frame.